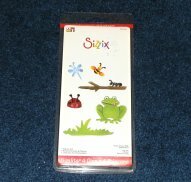 Sizzix Nature Set #655315. This is a 4-die set. Compatible with Sizzix Sidekick, BIGkick, and Big Shot Machines. This has been used very gently and is in excellent condition. All Midwest Craft Connection Items will ship out within 48 hours of cleared payment. This item is available online and at the Midwest Craft Connection Gifts & Crafts Store in Independence, Iowa. Thank you for looking at Midwest Craft Connection Crafts!